If you love books, be prepared to spend a thoughtful hour – or maybe three blissful hours if you tend to lose track of time in bookstores – at the new Mulhurst Bay Books and Gifts located in the former St. James United Church in Mulhurst Bay, northwest of the Community Centre on Township Road 472. 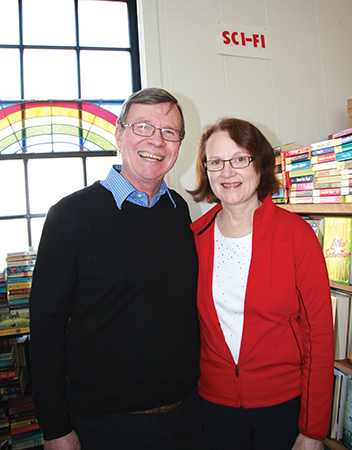 The proprietors, Kathleen and Dave, are former bookstore owners who look forward to meeting fellow book lovers at the Grand Opening on Friday, May 1, 2015. The store features mostly like-new, gently used books and new books, as well as handcrafted gift items. Mulhurst Bay Books and Gifts is open from May to Thanksgiving, Monday, Wednesday through Saturday from 11 AM to 7 PM; and on Sunday from noon to 7 PM. It is closed Tuesdays. These books are very affordable. “Most of the used books will run between $3 and $4 for paperbacks and $5 for trade books,” said Kathleen. “Hard cover books will be around $6 – $10, with new or first editions an exception,” added Dave. Imagine going to the bookstore with your kids or grandkids, browsing through the children’s, young reader and young adult book sections, then picking out a special treat. Tattoos, stickers, new puzzles, and craft books are there long with familiar authors like Munsch, Seuss and Roth; book series like Captain Underpants and Dork Diaries; and popular genres like manga, sci-fi and fantasy. Adult manga is available too! There is something for everyone – Canadiana, sports, history, humour, new age, mystery, westerns, romance, gardening, religious fiction, even wedding planning – mostly gently used, but there are a few new and hard cover books too. Whether you need a special occasion gift or simply admire handcrafted items, you will discover a unique assortment of jewelry, quilts and purses. Dave and Kathleen hope to include locally crafted items in the future. It’s always nice to receive a bookmark tucked in with a greeting card; both are available, including a wide selection of 3-D bookmarks. Need a new journal? You will be amazed at the variety offered here. Dave and Kathleen are pleased to offer special book presentations for seniors, libraries, church or other groups. They will prepare a talk and bring selected related books for display and sale. This special service is available by appointment in the off season only. Dave noted a previous talk on mystery authors was very well received. The group appreciated the convenience of having books come to them instead of having to drive to the city. “This is a great community,” said Dave, “and this is a unique spot with a special history.” The couple is currently researching the building’s background – first a school, then a church and now a bookstore. Please join Dave and Kathleen for their Grand Opening… share a few stories, enjoy a cup of tea, and discover a reasonably priced, good book.